I woke up late this morning I don’t know if I woke up and turned off the alarm on my phone (likely) or if the alarm just didn’t go off (unlikely.) What ever the case I work up late I sun was already on it way up when I looked out the window of my bedroom. Hot was an under statement; sun was beating me down like a Manny Pacquiao opponent. I kept running though, and for a while the sun hid behind some clouds but it was short lived. My pace suffered as a result of the heat but I was able to meet my objective of 13.1 and funny enough my body did pretty well for running two long runs on consecutive days! No major issues so I think I’m getting close to being able to up my distance to 20 miles. 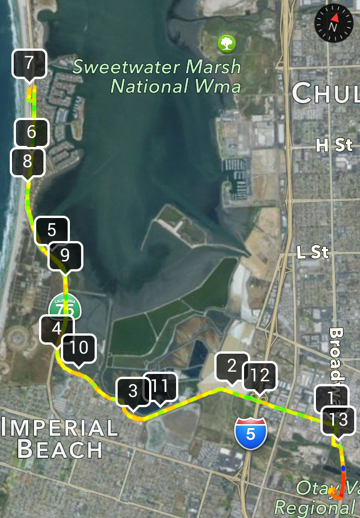 This entry was posted in Jogging, Running and tagged 13.1 miles, 21.2 km, Bayshore Bikeway, Half Marathon, run, running, San Diego, Saucony, Silver Strand, South Bay Salt Works. Bookmark the permalink. 6 Responses to RUN 13.21 miles: Ohhhh the Humidty! I would suggest some smaller increments before hitting 20. 15 the 18, perhaps. Although if you feel strong on the eighteen, just add in a couple of extras to round it out. Uhhhhh, my run yesterday was SO hot but I ran half of what you did. I couldn’t imagine going for another 6+ miles. Good job for just getting it done! It’s so hard running in the humidity. Good for you for sticking with it! Thanks 🙂 The humidity has been crazy here. The only good windows is between 1 and 4 am it seems like and I hate running in the dark.